S. 365, the Budget Control Act of 2011, is a landmark in American history, but for the wrong reasons. It is a fake solution to a phony crisis. It provides for a radical transformation of the structure of government. It is an attack on the principle of government of the people. All this in the name of fiscal accountability. The choice we have today, default or dismantling of the social compact through draconian spending cuts, is a false choice. The President could have simply told Congressional leaders back in December of last year that the debt ceiling was not negotiable, and invoked the 14th Amendment as a backstop. The “debt crisis” was spurred on by credit rating agencies of dubious integrity threatening a downgrade of the nation’s credit unless the government cut spending. Most of the cuts are guaranteed to hurt those who live at society’s margins, while S. 365 protects the investor class whose interests are served by the rating agencies. Unelected credit ratings agencies like Standard and Poor’s, the self-declared arbiter of U.S. government creditworthiness must themselves be subjected to a new level of scrutiny absent in the run-up to the Wall Street crisis. The credit raters helped to create that crisis too by procuring business through selling rating marks. The very idea that the sovereign United States must genuflect to dishonest rating agencies is antiquated and counterproductive to America’s economic recovery. The first is the recession. If we want to reduce the debt, we have to stimulate the economy, which is hobbled by a jobless recovery. America has 14 million people out of work. We have over three trillion dollars of infrastructure which must be replaced or rebuilt. We should be investing in America, rebuilding America, stimulating the American economy, priming the pump of our economy instead of capping our economic water well. Our GDP is lagging. This bill cuts nearly three trillion dollars in government spending, which is one of our main tools for fighting the recession. So much for the recovery. So much for putting America back to work. The second reason for the size of the debt is the Bush tax cuts. This bill fails to end the Bush tax cuts for the rich, which added a trillion dollars to the deficit. Not only are the wealthy not paying a fair share of the taxes but their privileged position is locked in, to the detriment to the rest of the society. This single action makes clear that this bill is a vehicle for the rich to get richer and the poor to get poorer. That working Americans are being offered a tax holiday is one of the cruel ironies of this bill in that the tax holiday adds more to the deficit on one hand, while requiring cuts to pay for it on the other. Those very cuts will undermine the social and economic position of those whom the tax holiday is alleged to help. The third reason for the size of the debt is the wars. This bill fails to realize savings from ending the wars. Instead it continues the wars in Iraq and Afghanistan at current funding levels for at least another 10 years. According to the Congressional Budget Office (CBO), “The caps would not apply to spending for the wars in Afghanistan and Iraq and for similar activities (sometimes referred to as overseas contingency operations). . . " If this bill required a slow drawdown of troops as the Reid bill did, it would save at least $1.2 trillion. It is inexplicable that we are creating more space for war and less space for jobs, housing, education, caring for our elderly, home heating assistance and a wide range of activities of any government which truly cares for its people. A policy of no limits for war and hard limits on domestic spending, coupled with hundreds of billions of dollars in tax cuts for the rich, disproportionately affects the poor and middle class. Wall Street has swelled with bailouts, multiple editions of largesse through quantitative easing, skyrocketing executive pay and bonuses, and freedom to gamble the public’s money through hedge funds. Main Street has suffered a massive loss of retirement savings, housing security, access to affordable health care, real wages and benefits, full employment and massive loss of small businesses. The wealth of America is being accelerated to the top and this bill pushes that acceleration. This bill is a direct assault on representative government. The House of Representatives and the Senate consist of 435 and 100 Members, respectively. With the creation of a super-committee, the Congress has been reduced to a czardom where 7 of 12 members are given the power to determine the course of the American economy, with hordes of K Street lobbyists already poised to swoop in to protect their narrow interests against $1 trillion dollars in deficit reduction measures. The Congressional committee and subcommittee process, with its membership composed of individuals with expertise in specific areas, is designed to encourage thorough consideration of measures which affect the lives of hundreds of millions of Americans. This process is now abandoned. Abandoned with it is the intent of the founding Fathers when they established the House of Representatives specifically to avoid such a dangerous concentration of power. The super-committee is poised to cut Medicare, Medicaid and Social Security while limiting accountability. We could have avoided this hostage-taking if the President chose to apply his expertise in Constitutional law to invoke the 14th Amendment of the Constitution to raise the debt ceiling. Instead, we are taking America from the New Deal of 1932 to the Raw Deal of 2011. We should be focusing on strengthening Social Security, Medicare and Medicaid and creating jobs. The Democratic Party is running away from its traditional role of protecting the poor, the elderly, and the working class. To whom do these groups now turn? 1. Kucinich speaks the Truth. 2. Exactly DK. It is a fake solution to a phony crisis. 3. Lots of great lines and great points in there!! 5. I don't believe Kucinich would lie. There's noting to be happy about. Kucinich is telling it as it is, not like some want to pretend. John Sarbanes (son of former Sen. Paul Sarbanes) of Maryland. I am so proud of him, and thanked him for his vote. Tonight, I voted against what I believe was a one-sided deal on deficit reduction and a dangerous precedent for future discussions on our nation’s debt ceiling. It was certainly not a balanced approach to securing our nation’s future. I did not arrive at this decision easily. I recognize that raising the debt ceiling is the only way our country could continue to meet its obligations. That’s why I voted to raise the debt ceiling in June to ensure that the U.S. Government pays its bills on time and in full. I was concerned at the time that delaying action would lead to a prolonged standoff with risky consequences. Unfortunately, my fears were confirmed and the result was the proposal on the floor today, which will lead to significant cuts to programs that benefit the most vulnerable Americans while preserving tax loopholes for oil companies and other special interests. One of my principal concerns is that the structure of this deal will hamstring our ability to ensure an economic recovery. I believe the bill passed by the House tonight will box us into a set of dangerous triggers and spending cuts that could have a dramatically negative impact on ordinary citizens and on those commitments needed to make our country strong. It puts our budgetary decisions on auto-pilot because we did not have the foresight to meet this challenge in a more thoughtful way before we reached crisis stage. At the beginning of this debate I said I would be prepared to make a tough decision, and that I could support a package if it was a balanced approach to deficit reduction that cuts spending, does not impede economic growth, and maintains important investments in our future. I do not believe this deal meets those criteria, nor does it represent shared sacrifice by asking the wealthiest among us – those who have done very well even in this economy – to step up and contribute their fair share. The deal that was brokered will cut $1.2 trillion in spending over the next ten years and will establish a joint, bipartisan committee made up of 12 members of the House and Senate to develop legislation that will reduce the deficit by an additional $1.5 trillion. However, if the legislation proposed by this committee does not become law, all of those additional savings will come in the form of automatic spending cuts that will go into effect for fiscal years 2013-2021. Although entitlement programs have largely been exempted, if the automatic cuts are triggered, Medicare providers could see reduced payments and many other programs we have fought to preserve will be back on the chopping block. It is expected that this legislation will soon pass the Senate and be signed into law by the President. Now that we have put this debt ceiling crisis behind us, we should return our focus to other pressing challenges facing our nation. Our long-term economic security will come from advancing strategies that invest in our infrastructure, reinvigorate our manufacturing sector, and increase our exports to world markets. I remain concerned that this deal sets us back on that front but I will redouble my efforts to enact policies that create jobs now, and help us rebuild our country. 6. Dennis spoke the hard truth here. We are taking America from the New Deal of 1932 to the Raw Deal of 2011 indeed! 7. Thank God for Dennis Kucinich! 13. Anyone know how many no votes were cast? any other lefties or just Kucinich? Kucinich has it exactly right -- as usual. ...but can someone explain to me why it includes this: "BILL TITLE: To make a technical amendment to the Education Sciences Reform Act of 2002"? but this is a good example of the use for the Congress forum, I think it should be part of the "big forums" so people will use it for questions about rules and specific bills. BILL TITLE: To make a technical amendment to the Education Sciences Reform Act of 2002 ? MSM gies him no podium or to anybody else who speaks the truth! 18. Some days, it's not even worth chewing through the restraints. I've always had a great sympatico with your sig line.... Particularly appropriate tonight. 20. K&R - Excellent words from Kucinich. "The Democratic Party is running away from its traditional role of protecting the poor, the elderly, and the working class. To whom do these groups now turn?" 21. "I can cast a meaningless no vote and make people think it's on principle." "What a bunch of dumbasses!" The gullible groupies circle the wagons! 46. This message brought to you by Woodchucks United Against Principles. debt ceiling bill. The cuts will harm our economy over all, lower our GDP and, ultimately, result in higher government debts. It is counterproductive. Kucinich explains the reality very well. The bill makes no sense. Because we are too many generations away from the great Depression so we need to relearn the important lessons therein. This will help speed along the next great Depression so that we can learn firsthand what our grandparents and great grandparents knew to their very bones. Yes, sarcasm. It's all I have left. 22. Don't blame me, I voted for Kucinich. 39. I did in '04. By the time my primary rolled around in late May of '08, there was nobody worth a vote on my ballot. Dennis, you go down as a hero, you tried, and now I see why folks like you never sit at the table... because it's not your "Club" either. They will do whatever is possible to keep folks like you out, you threaten them. ...to STAND UP and tell The DAMN TRUTH! ”Unlike the other candidates, I am not funded by those corporate interests. 25. Thanks, Kooch, for telling the truth. One of very very few real liberals we have. 34. 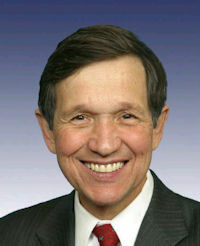 The whole debt ceiling debate was a way of silencing Kucinich. His debt ceiling bill. Listen to today's Democracy Now, and it all becomes clear. My Rep. voted Nay, too. I support both DK and Rosa DeLauro (CT-3). "Most of the cuts are guaranteed to hurt those who live at society’s margins..." reminds me of the IMF and the World Bank. The only thing that I can see is that Boehner flip-flopped and endorsed the same deal he voted against last Friday. It had to be Obama saying that he would not invoke the 14th amendment. That's the only difference that I see from last week to this week, when Boehner acted like he had won the battle. To my way of thinking, there should have been one more round to the fight. cause Boehner to accept this deal? That makes no sense to me. 63. Because then Boehner flip-flopped and accepted the deal. Knowing that the President had to accept it. The Democrats in the House were told that Obama would not use the 14th amendment, so the deal was struck during the weekend. We still had until midnight Tuesday to get a clean bill, but that was not in the cards. not to use the 14th Amendment caused Boehner to flip-flop and accept the deal. I want to know what the cause and effect relationship was in your opinion, not just that it happened. Is there some secret deal that we don't know about? 44. DK for president in 2012! there exists and inverse relationship between power and integrity. The dream team, thoughts become things, maybe we can make this happen. They're too left-wing for the majority of the country to take seriously, and that's a shame, because they're what America needs more than anything else right now. Any comment on the article itself? It is irresponsible not to make a deal if at all possible. The deal is acceptable enough not to put the country through the disarray that would happen: invoking the 14th over this would not have been simple and accepted. ON April 13 a senate subcommittee found S&P to be a "key cause" of the financial crisis - on April 18 S&P downgraded the outlook for US sovereign debt from stable to negative. I will not vote for one term Barry again, he's either a Rethuglicon Trojan Horse or he doesn't have the ability to lead this country, either way I prefer a better choice than what has presented itself to date. Draft Bernie Sanders or Dennis Kucinich to primary him on the Dem. ticket or run as Independent's. We have to have a real leader who passes the integrity, trust,and credibility test, someone known to defy the overlords. I know, I'm probably dreaming. 61. Damn, too late to rec.